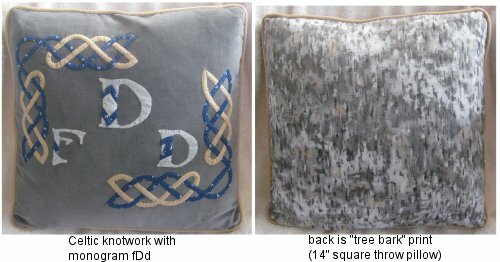 I found a freebie Christmas machine embroidery of "I Believe" on SewForum and paired it with some "Believe!" flannel from Joann's to make her a throw pillow. The embroidery was done on a white-on-white quilting cotton fabric and red piping framed the oval embroidery. Unfortunately, at the time I saved the design, I wasn't saving the digitizer's name. I recent search of the SewForum site turned up no results. Sooooo ... I regret that I can't pass along the link to the design. 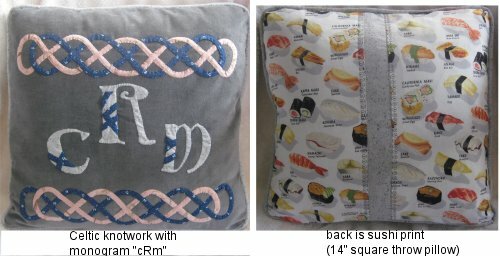 Since my daughter likes sushi (to me, aka "fish bait" or less appetizingly "chum") I backed her pillow with a sushi print. I only had a long narrow strip of it; not enough for the width of the pillow. So, I joined the long narrow strips of sushi print with another narrow strip of the gray speckled fabric I used for the monogram. I also used one of my decorative stitches on my sewing machine to embellish those seamlines.